An icon is a small picture which represents a file, folder, application or device on a computer operating system. It's icons that you see in almost all the toolbars and in the menus of different computer application software. When you place the cursor on the icon and click it you launch the program or the function. To create an icon is not an easy thing to do. It must be original, distinctive, and tiny. Besides it must be possible to be clearly seen on a wide variety of monitors set at different resolutions. Nowadays most document and files in addition to their file name have icons. Normally they are generic images, representing the program used to create the file, or the file type. In the case of graphic files most modern systems often replace the generic icon with a reduced image of the graphic. This reduced image usually fits into a 128x128 or a 117x117 pixel box, depending on the operating system used. It is available in a "thumbnail view" or within some other specialized viewing area on the screen. 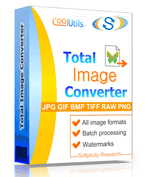 Once you need to convert any files to ICO or ICO to tiff, jpeg, bmp, png use Total Image Converter. It's fast, easy-to-use and always preserves the highest quality of your images.